Tens of thousands of people in Serbia and Bosnia have fled their homes as the Balkan region suffers from its worst flooding in 120 years. Three months’ worth of rainfall in mere days led not only to catastrophic flooding but also devastating landslides. Roads, homes, farmlands, and villages have been destroyed. More than 30,000 people have been evacuated from their homes in Serbia, and 100,000 in Bosnia. At least 49 people have died so far. A Samaritan’s Purse team from our affiliate offices in the United Kingdom and Canada arrived in Belgrade, Serbia’s capital, on May 23. We are working with church leaders and Christian organizations to offer support such as food, water, sanitary items, and other essential goods to those in need. 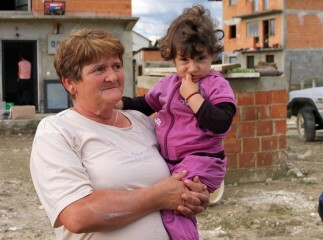 Stoja and her granddaughter, Nevena, are among the 130,000 people impacted by the disaster. In the small community of Gomjenica, Bosnia—nicknamed “Rupa” or “the hole” because it is a former quarry—all 24 homes were flooded. Most of the families came here after fleeing from around Sarajevo during the Bosnian War, and many of them barely escaped with their lives the day the floodwaters came. “This is the second time we have lost everything and are starting from zero,” Stoja Anicic said. Stoja was in total shock when the waters reached her home where she was with her 2-year-old granddaughter, Nevena. With the water at knee height, she took Nevena and climbed in the back of a jeep to escape. The water continued to rise as high as the windows—about six to nine feet in most places. A diabetic with a heart condition, Stoja was deeply affected by the chaos of fleeing her home in the midst of the flood. The doctors still visit every three days to check on her ongoing health issues, but she refuses to go to the hospital so that she can be here to clean up. Although most people in this community went to stay with friends and family while they waited for the waters to recede, almost everyone has now started to clean up their homes. Samaritan’s Purse teams from the U.K. and Canada are working with local church partners to meet the needs of flood victims. 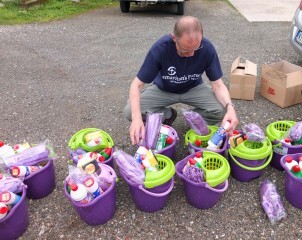 Samaritan’s Purse is partnering with Pastor Danko Malesevic of Bread of Life ministry to provide much-needed cleaning kits for the residents that include a mop and bucket, cloths, gloves, a broom, a dish soap and sponge, garbage bags, scrub brush, cleaners and disinfectants, and hand towels. Stojan and Milka Males, in the same community of Gomjenica, only had a few minutes to flee their home. They were unable to save anything. The water tore their house apart. The family removed everything—all the destroyed contents of their home—and a truck hauled the flood-damaged pieces of their life away. Adding to the loss, the family’s dog drowned in the flood. “He didn’t have time to run; it was that fast,” Milka said. A Samaritan’s Purse ministry partner delivers supplies. The water rose up to the roof of the home they had built for their family of five. They are staying elsewhere but come back to clean every day. “The way I ran from my first house as a refugee, ran away without anything … I’m used to anything now, after this flood as well,” she said. All they have is the clothes they were wearing when they fled. With Samaritan’s Purse support, Pastor Danko will continue to provide this community with cleaning supplies and other basic items in the days and weeks to come. In Paracin, South Serbia, we have been working with a team from Kiononia Christian Fellowship in the home of Biljana Mihailovic. Biljana, 67, has been a widow since she was 39. She has one daughter living in Stockholm and a granddaughter who is disabled. After saving for a lifetime, Biljana finally bought her house five years ago. 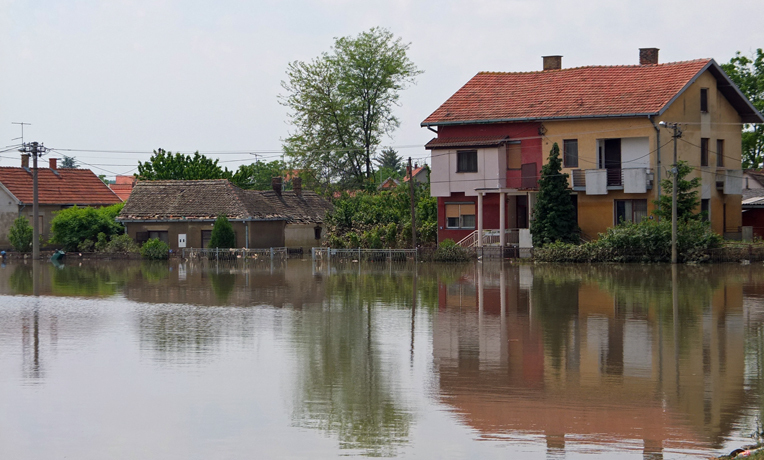 On the day of the flood, Biljana was sitting in her house when she heard a noise. The water ruined all the belongings in Biljana’s house. Biljana stepped onto a garden bench, then the fence. Her neighbor, a firefighter, told her to go to him. She jumped into the water, which was up to her chest, and made her way into the road where a truck picked her up. Relatives and neighbors gave her dry clothing and accommodation for four nights before she could return. 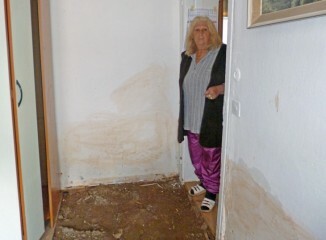 Biljana’s home flooded three feet. Although the waters have receded, the water line is clear for all to see—both inside and outside. A Samaritan’s Purse team has been working to give Biljana a room in her house that is dry and sound so she can begin to rebuild her life. The team cleared the room and took up the wooden floor. Then the wet sand floor was dug out and replaced by a new concrete floor. Once the concrete is dry, Biljana will have a space where she can begin to reorganize her home. We also helped provide her with some materials and tools, which will be useful for further efforts in the coming weeks. “It (the work you are doing) has motivated me to carry on,” she said. 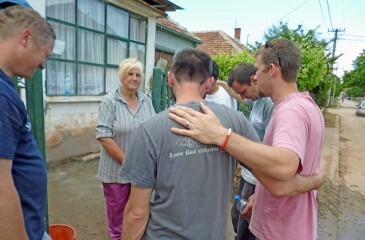 The team prayed with Biljana after creating a dry room in her home. While our team was working on her house, Biljana went out, bought some paint, and started on her small kitchen. Before our team left, they presented Biljana with a New Testament in Serbian and prayed with her outside her house. One senior pastor said that he feels Serbia will never be the same again. He believes this disaster will bring about a cultural shift. Please join Christians in Serbia and Bosnia in praying that it will be for the better, and that many will cry out to God for His protection and salvation. Samaritan’s Purse has been active in Bosnia and Serbia for many years through Operation Christmas Child and The Greatest Journey discipleship program. In 2013, Samaritan’s Purse sent more than 50,000 gift-filled shoeboxes to bless children in each country. Over the years, Samaritan’s Purse Canada has also partnered with a church in Novi Sad, Serbia, to minister to the needs of their community, including hospice care and drug rehabilitation.